After the devastating earthquake hit Haiti in 2010, funds for relief, recovery and rebuilding efforts began to pour in. Since then, MCC has focused our advocacy efforts on accountability and transparency of those funds. 2014 marked a huge step forward for aid accountability in Haiti. The “Assessing Progress in Haiti Act”—a bill that requires better documentation from the State Department and a new three-year strategy for U.S. government projects going forward—was signed into law. The bill garnered support from a broad coalition of faith-based organizations and development agencies and marks a significant step towards transparency in post-disaster relief and rebuilding efforts. The significance of this bill lies in its mandate for the U.S. government, the largest foreign aid donor in Haiti, to ensure consultation with a broad spectrum of Haitian civil society and to provide transparent reports on how money is spent and who is contracted to carry out projects. All of these components have been lacking in the post-earthquake rebuilding work of the U.S. Agency for International Development (USAID). But the challenge of rebuilding in Haiti is still not over. Even now as we mark five years after the earthquake, housing and infrastructure are still deeply in need of attention. While the rubble has been swept away in Port au Prince and the camps are not as visible to the unassuming eye, more than 85,000 people are still living in temporary camps under tents that are becoming all too permanent. MCC continues to advocate for equal housing rights and an end to forced evictions of people living in camps, even as policymakers have turned their attention to other concerns. 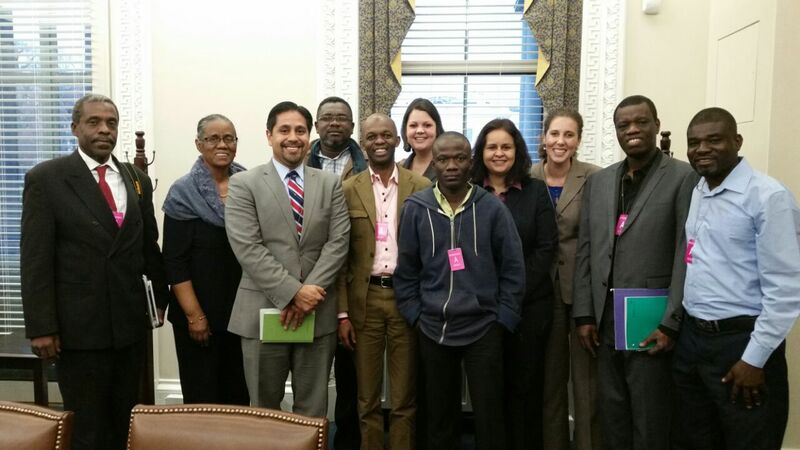 Haitian civil society partners at a meeting with the National Security Council following the housing conference in November. In November, staff coordinated a conference at George Washington University titled “Fooling the Sun, Not Fooling the Rain: Housing and Shelter in Haiti 5 Years after the Earthquake.”MCC brought representatives from partner organizations in Haiti working on housing justice to Washington to discuss the current housing crisis and to propose solutions to ensure that all Haitians have the right to adequate housing. They were accompanied by Ted and Katharine Oswald,policy analysts and advocacy coordinators for MCC in Haiti. Conference attendees included staff from multilateral organizations like the Inter-American Development Bank and the World Bank, congressional offices, State Department, USAID and academics. Our aim was to facilitate dialogue between sectors that rarely takes place in Haiti or Washington and to present a different narrative about Haiti than the one that is often discussed in Washington. Our advocacy also focuses on the issues of cholera in Haiti, improving water and sanitation infrastructure, and seeking justice for victims of cholera and their families. More than 70 members of the U.S. House of Representatives recently issued a letter to the U.N. Secretary General regardinga claims mechanism for victims. As we mark the five-year commemoration of the earthquake in January, MCC continues to advocate for policies that promote holistic development efforts across all sectors in Haiti. Our work continues to uphold the importance of democracy and human rights as a foundation for solid rebuilding efforts to make a difference in the lives of all Haitians.